Kleenexgirlwonder's After Mathematics is a solid collection of lo-fi, electro-pulsating gentile pop songs that owe as much to 70's era CBGB's rock as it does The Beatles. This is blue collar rock-pop, flying around with loose guitars, jangly melodies, and enough rough edges to get cut on, but plenty of smoothed places to ensure the songs go down easy and get stuck in your head. 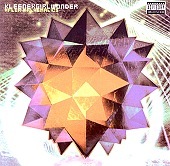 From the bouncy, sunshine pop of "I Am A Serving Wench At A Themed Restaurant" to the electronic pop instrumental "The Intentional Fallacy", Kleenexgirlwonder delivers one of the year's sharpest, most contagious blends of past, present, and future with its throwback to 60's pop and futuristic electronic rhythms. I'll give it an A+.